Review of "Ring of Honor: Stars of Honor"
Brian Elliott: Nigel, we're getting the chance to chat today thanks to the fact that the first two general-release Ring of Honor DVDs have just emerged in the United States. I must say I'm glad to see the ROH product getting out there, because Ring of Honor and Pro Wrestling NOAH - two companies that you have worked a great deal for - are in my opinion the best pro wrestling products in 2008. And, in fact, it's been that way for quite some time. Nigel McGuinness: Thank you Brian, that's really nice to hear. Fine praise indeed! With these DVDs, its not so much about putting ROH's best matches on there - though they are great matches - but moreso about including guys that people have seen already, like CM Punk. Brian Elliott: With "Stars of Honor" in particular, that certainly seems to be the case. Just to begin on your own career, though, what was your first exposure to wrestling? Nigel McGuinness: It probably would have been when I was six or seven years old, back when World of Sport was still on ITV. By the point that I started watching, they had begun showing British wrestling one week, and WWF (now WWE) the next. I was a big fan of both, to be honest, though I never did get to see wrestling live in England. When wrestling disappeared from TV, I lost contact with it completely, and like most people even today, I didn't know that there was local wrestling going on near me. The next time I saw wrestling was when a friend of mine got a copy of Summerslam 1990, and I remember all of us sitting around the TV to watch it. We were all big fans at the time, but for some reason, I never grew out of loving wrestling. It was only a couple of years later that I decided that wrestling was what I wanted to do. Brian Elliott: Were you the athletic type in school? Nigel McGuinness: I was never the best at sports, but I was always a good hand. I played a lot of tennis growing up, and I was just below the county level in that, and I always played football and rugby. I think one thing that helped me get into wrestling was the fact that I always had an obsession to do something different with my life, away from the norm. I knew that I was never going to be good enough to play one of those sports, and I guess I thought that the happy medium between sports and entertainment in wrestling would be my best avenue. Brian Elliott: Was there a specific point where you decided that you had to be a professional wrestler? Nigel McGuinness: Well, when you get to a certain age you start to get all of those questions in your mind, wondering what you are going to do with your life, and I was no different. I remember watching WWF Superstars of Wrestling, when "Rowdy" Roddy Piper did an interview which was loosely based on Martin Luther King's "Dare to Dream" speech, and he talked about how he got into the wrestling business when he was 15, and how it got him out of trouble on the streets. I never understood why he said what he did, because it didn't build to a match or anything like that, but he looked into the camera and said something like 'So for any of you out there who want to be a pro wrestler, dare to dream and never give up, because it'll be all right if you never give up', and that struck a chord with me. Also, Robbie Brookside, who is a very good British wrestler, did the "Video Diaries" documentary. I remember seeing Robbie - who by his own admission is a pretty normal looking and pretty normal acting guy - and thinking that there maybe is a chance for a regular looking guy to make it in this business of giants. That gave me a lot of inspiration. Brian Elliott: Did you ever actually receive any wrestling training in England? Nigel McGuinness: No. If we fast-forward to when I was actually thinking about how I could get to be a wrestler, I travelled the world when I was about 19, and I read a little advert in a magazine about how to get involved in the wrestling business. So I sent away for the information, and I got a reply about six months later. There was a list of all of the wrestling schools in America, so I wrote off to each one. The school run by Les Thatcher (who has worked as a wrestler and trainer for nearly fifty years) in Cincinnati was the only one that wrote back to me, and I eventually went over there in 1998. Brian Elliott: Is it true that you learned to wrestle in a mostly American style, but then later were advised to learn some British style wrestling? Nigel McGuinness: Yeah. Les was predominantly a tag team wrestler who worked in the South East wrestling territories, back in a time when tag team wrestling was really the main feature of a show. He was a fantastic tag team wrestler, so he taught me that style, which was a great basis for wrestling in America. But I got to wrestle on one of the Brian Pillman Memorial shows, and William Regal (an English wrestler now plying his trade in WWE) was gracious enough to come out to the stands and watch my match and then come backstage to talk to me about it. To cut a long story short, he said that if I wanted to be a British wrestler, that I had to go back to England to learn how to wrestle that way. So I went back to England to wrestle for Brian Dixon, and I met Robbie Brookside, Chic Cullen, Skull Murphy - all guys that I'd seen wrestle on British TV. Brian Elliott: Obviously, the advice turned out to be good for you, but did your heart sink when Regal gave you that feedback? Nigel McGuinness: Well, let's just say that it wasn't what I was expecting to hear! (laughs) But anytime I've received criticism, if it's been constructive, I've always tried to take it on board. Brian Elliott: Once you began receiving training, how long did it take you to begin feeling comfortable in the ring? Nigel McGuinness: Well, it's funny you should ask that, because with Les, it was a full year before I was allowed to wrestle. This was a year when I couldn't work in America, as I only had a visa to go to school there, and I had to pay for everything myself. So there was food, and I was eating every three hours to try and gain weight, I was paying rent, I was paying flight fares back and forth, and I'd actually go these shows that we ran, and I'd sell the t-shirts (laughs). But I was so gung-ho about being a wrestler, that it didn't occur to me that I was spending all of that money really just to sell t-shirts! But what happened was that because I was training four times a week every week, and I was watching all of the matches without having to worry about my own, that I was very confident when I finally did go in for my first match. In fact, I was more confident about that match than I am now! Brian Elliott: How did you eventually end up in ROH? Nigel McGuinness: It was through Matt Stryker and BJ Whitmer, who had also wrestled in Cincinnati. When they originally got into Ring of Honor, and after they had established themselves about six months in, they brought a DVD of mine to (ROH supremo) Gabe Sapolsky. I think Gabe had perhaps seen me wrestle in the IWA Mid-South promotion, but I got to come in and have a match with Chet the Jet, and it continued from there. But it really took around three years to get to ROH. Brian Elliott: Were you aware of the cult following that Ring of Honor had? Nigel McGuinness: You know, when I first watched Ring of Honor, I didn't quite get it. But I think when you're in the wrestling business, you hear so much that sometimes you forget what it is like to be a fan. But that's the whole point, because you are trying to connect with the fans. Their opinion is so much more important than that of anyone who is inside the business, because the fans are the ones who are buying the tickets. A lot of times what I like to do is to find a friend of mine who is a casual fan of wrestling, and show him one of my matches. And what I find is that that person's insight is astounding, because they haven't been blighted by inside knowledge of the business. So it wasn't until I had got the idea of what pro wrestling was really all about, that I started to realise that there was other wrestling out there. Brian Elliott: Was there a match in ROH that you think was a breakthrough for you? Nigel McGuinness: Certainly the match with Bryan Danielson in England saw me move up to the next level. And I always knew that would happen with him, because from the first show that we were on together, I had this eerie feeling that somewhere down the line we would wrestle, and it would change my career forever. Brian Elliott: Are you proud of having come back to the UK with ROH? 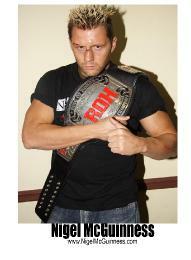 Nigel McGuinness: Very much so. Being a British wrestling fan myself, it is very special to come back. It's great to see that sense of excitement in the fans eyes, that you just don't get in America. I can't really explain it, but there's something about being British, and being a British wrestling fan, that makes it different from anywhere else in the world. Brian Elliott: Prior to winning the ROH World Title, had you thought for a while that you were ready for it? Nigel McGuinness: No, not necessarily. Of course my character would say yes! (laughs) I think that what with how the former champions like Danielson and Morishima raised the prestige of that belt, for anyone to be considered as a champion in ROH, you have to take a step back and think about how big those boots are to fill. And when I tore my bicep and got a concussion in that one title-winning match, there were lots of people that doubted me in the same way that I perhaps doubted myself before I won the belt. But you just have to look at yourself in the mirror, look at the scars on your face, and realise that you do deserve it. You have to make a run with it. Brian Elliott: What did that actual title-winning moment feel like? Nigel McGuinness: I have to say that I don't remember. In the build up to that match, the whole 'chasing the title' bit with Morishima, I was getting the s*** kicked out of me on a nightly basis. I had a lot of problems remembering things. I think I was just very relieved that that series of matches was over. There's a true reality to this violence, getting beaten up that bad, and I think at that point I was just glad that it was over. You know, sometimes I just wish the fans could feel what it is like to be in a Ring of Honor match, because people can say what they like about professional wrestling, but when you kicked in the head or catch a knee in the face, it's as real as real can be. I wish that people could feel what it is like to be a wrestler in Ring of Honor, even just for a moment. Brian Elliott: You've done several tours with Pro Wrestling NOAH. Do you like Japan? Nigel McGuinness: Yeah, and in a way it reminds me of British wrestling. In Japan, pro wrestling is seen almost as a sport. They respect professional wrestlers in the same way that they respect they respect their other athletes. It's nice to be a part of that, and to be given gifts and asked for autographs. The people are wonderful there. Brian Elliott: Given that they are the biggest wrestling company around, have you considered going to WWE? Nigel McGuinness: It's a difficult situation. Before I went to Japan, I had a tryout with them, and I wrestled a couple of times in Ohio Valley Wrestling (at the time, a part of the WWE developmental system). They were interested, but I had already been booked on the tour of Japan, and I didn't want to cancel that. When I returned, the interest didn't seem to be there. I think that WWE has so many people jumping through hoops just to get there, that if you don't immediately drop everything to be there, they lose interest. But at the point where they were interested in me, I hadn't wrestled all over the world, I hadn't taken that really big step up in ROH, and I hadn't developed my style to the point where I feel as confident as I do now. Who knows, had I dropped everything, I could have been at Wrestlemania this year, in a good spot. But now, I must say that guys like myself, Danielson, and Aries, we're so gung-ho about Ring of Honor that we're hoping that we can get to the stage where we don't have to go to WWE. We want to create a place here where we can give our best, in our version of professional wrestling, and have something to show for it when it comes time to retire. Brian Elliott: Is there anything you would like to say to your UK fans, who perhaps have not managed to catch a glimpse of ROH yet? Nigel McGuinness: Just to give Ring of Honor a try. I can't conceive of anyone watching a Ring of Honor show, and being disappointed by it. I think new viewers would see the talent that we have in the company, and a diverse styles of matches. Whatever type of wrestling you like, there is some of it in Ring of Honor.